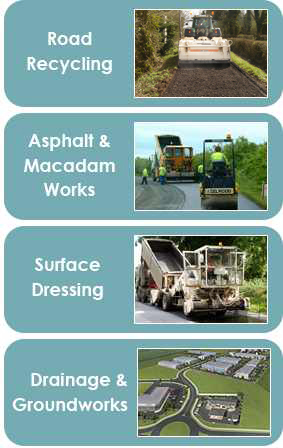 At Callington Ltd, we offer a range of road product solutions to our clients. From new road construction to specialist surface treatments, we aim to deliver a cost effective and durable product. We balance the best of traditional skills, with the need for modern methods and materials. Road recycling is ideal for the rehabilitation of damaged or distressed roads giving a fast and economical reconstruction solution. Road recycling involves milling up the existing road materials and spreadingÂ or mixing through appropriate binding agents (bitumen emulsions) so that the new matrix forms a new roadbase for the road. Finally an appropriate new surface is applied to the carriageway. Asphalt surfacing is also referred to as tarmacadam. It can be machine laid or hand laid depending on surface area to be covered. Surface dressing is applied to existing surfaces in need of sealing and restoration of texture. A fast setting bitumen emulsion is sprayed onto the road surface followed by an application of premium quality aggregate. We provide site development services for small to medium specialised projects, to our commercial, industrial and domestic customers. This includes initial site clearance, preparation, drainage, kerb and concrete laying. We can assess your requirements and advise you on the right surfacing treatment for your needs. With our experience and expertise we are able to provide a high quality service and assistance to our clients.